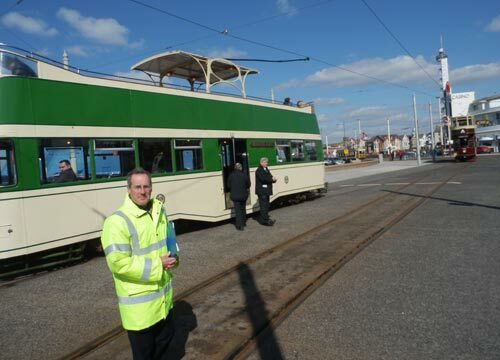 Good Friday and the first day of 2013 Blackpool Heritage Tram running on the prom. Some of these trams were built in Preston in the 1930s. Known as Balloons they have the streamlined look. 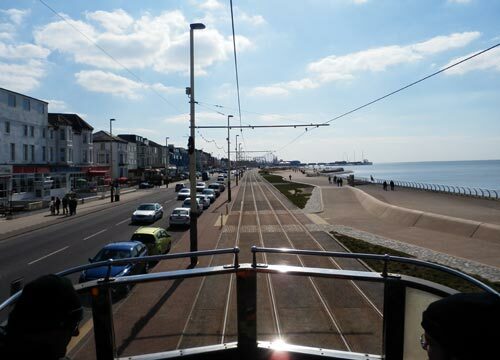 The weather was good and we saw the first Heritage Tram running to Fleetwood with a full load. 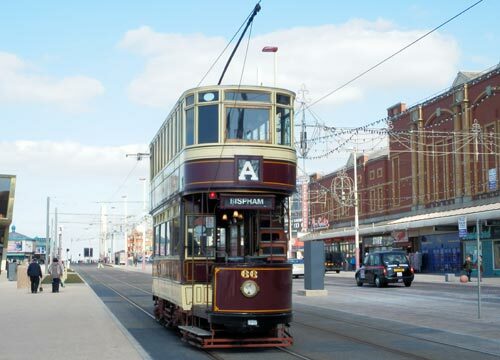 Most of these trams go between the Pleasure Beach and Bispham. We also saw the open top double decker tram, Princess Alice, going north so we thought we'd wait for it to come back. 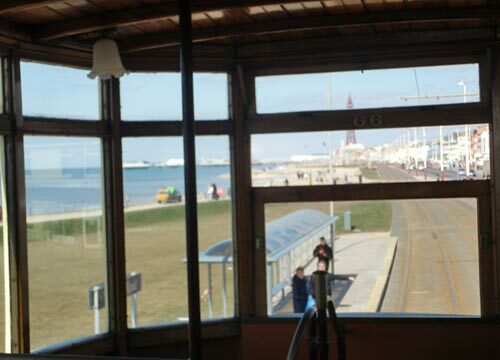 We did some shopping and then wandered out to get the tram at the special Heritage Tram stop near North Pier. £2.50 for a return to the Pleasure Beach. Seemed a good deal. We must be on dozens of photos there were people snapping all along the ride. Princess Alice is a real beauty. We went out on Alice and came back on the old Bolton Tram. Photo of Princess Alice and tram number 717, Balloon Trams made in Preston in the 1930s. Some nice features on this tram. View from the upper deck of Princess Alice around noon on Good Friday 2013. 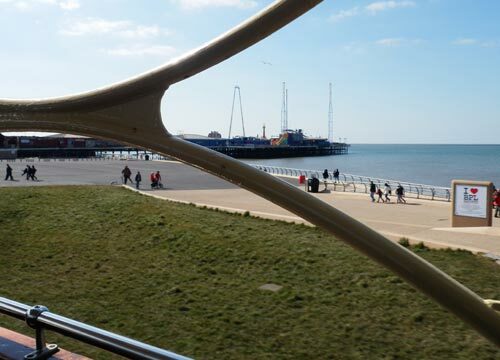 South Pier and the new grasslands of Blackpool Promenade from Princess Alice. Princess Alice with the friendly manager (I think) of Blackpool Heritage Trams in his yellow jacket. He was doing a good job with his list of tram times. 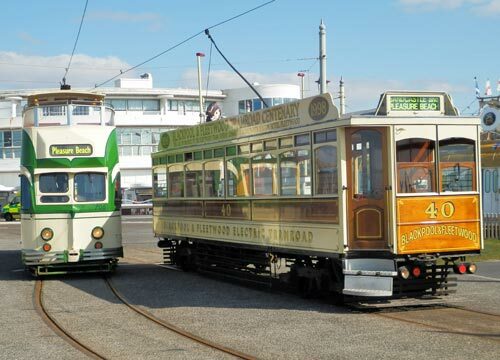 Two Blackpool Heritage Trams around 100 years old and a modern Flexity tram. Easter 2013. The tram known as Bolton. Nice rider, stairs a bit steep. Riding on Bolton, fresh air with the front window open. Someone holding out an arm to stop the tram but they need to get to a Heritage Tram Stop as these old trams aren't cleared for the new Flexity stops. 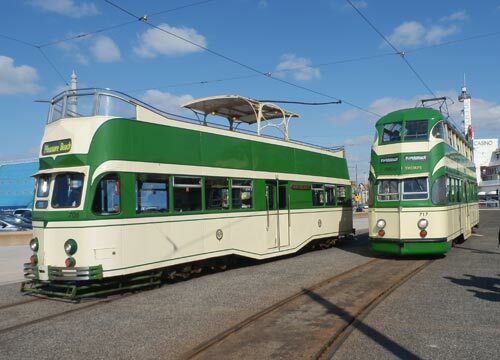 Some old trams have been modified with doors that reach to the platform and these are known as the B Fleet and many are Balloon Trams made in Preston. They'll be running in May. 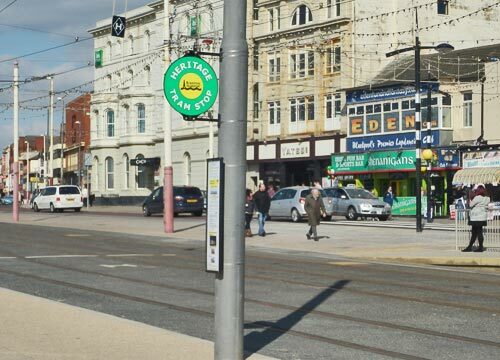 A Blackpool Heritage Tram Stop, these are at:. 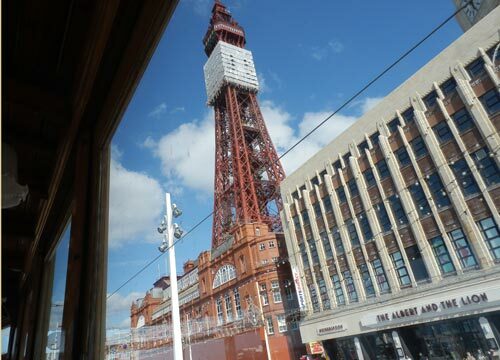 No story is complete without a view of Blackpool Tower. Still being refurbished but open inside. Albert and Lion Weatherspoons pub in the old Woolworths Building. 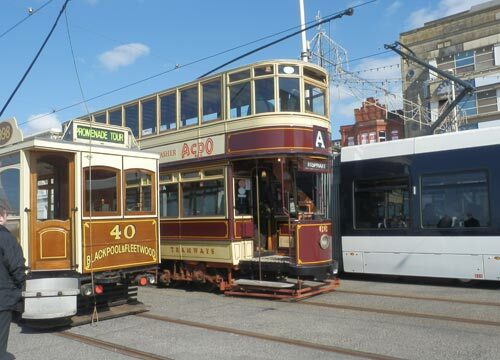 Princess Alice with Blackpool and Fleetwood tramway. There is a full set of timetables on Blackpool Transport website and the leaflets are all shown on the Civic Trust website linked below. Leaflets on Blackpool Civic Trust website. 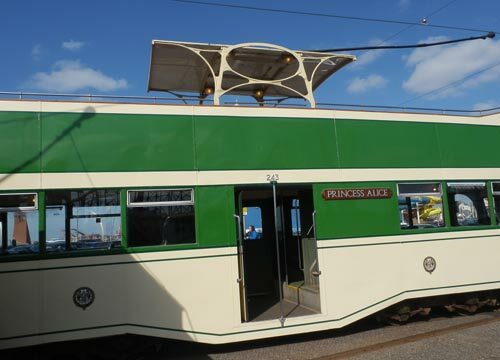 The Heritage Trams are only running at public holidays in 2013. In May is a special event using the modified Balloon trams on the new stops.